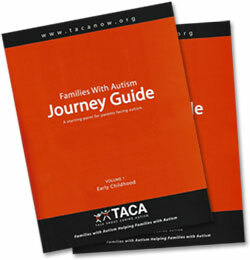 TACA has recently updated our Autism Journey Guide Volume 1 and ANNOUNCING Volume 2. Based on where families are on their journey, these two valuable guides are available to guide, support, inspire and empower the next positive steps for your child. What Autism Journey Guide is right for your family? These guides are written based on experiences with other TACA families, paraprofessionals, and considers some “best practices”, alternative ideas for treating autism both medically and via traditional therapies. Back in 2001, the original guide started out with 25 copied pages of articles, resources and information to the guide it is today. It continues to be a work in progress and information is constantly changing and items being added to this document. The goal of this nearly 400-page guide is to provide you the parent with information, research, and parent input on where to start, what works for other families like yours, and important next steps on treating autism with the intent of recovering your child. While not all children who follow these steps recover from autism–many greatly improve their condition. How Can You Get the Families with Autism Journey Guide? I want to thank our anonymous sponsor for making the printing of this guide happen. Thank you. We couldn’t have done it without your support.